I've seen plenty of box bags listed on etsy and floating around flickr but I'd yet to see the one for me. You know what I mean, that fabric that just grabs you and screams your name. I'd never made a box bag before, but after looking over a couple tutorials and realizing that it's just a basic zippered pouch with the ends pinched in, I figured it out on my own. No lining inside, I don't like how they tend to wiggle around and shift. The raw edges were all finished with the serger. If I make another one, I'll add a few more top stitching finishing details on the ends but overall I love it. Finished size is 8" long, 3.5" wide and 4" tall. Just the right size for two balls of yarn and a colourwork mitten. It looks fantastic! I should really try to replace my ziploc baggies with some nicer yarn-containment devices, too. I love those two colors in the bag in that last photo! i love that bag. and the fabric. so... when will they be in the shop? Vovlos? You sewed a Volvo?! 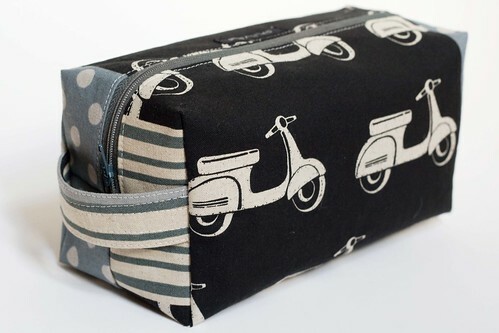 OMG it is scooter fabric!! I am going to NYC next week if you want me to get you something! And you'll be selling your first batch when? I didn't think anything could make me more wanton than the sparkly vampire camera strap, but I was wrong. Oh so wrong. Easy for you to do! :o) It's fabulous. Love the way you used the fabric. Oh wow, that is a great project bag. I love the fabric, too...I am just discovering fabrics and there are so many possibilities!! I hope we do see it in the shop one day! I agree with everyone else - I totally want one. 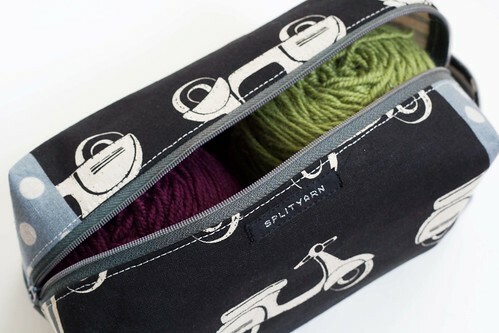 This is such a perfect little project bag. Perfect! You are a genius with the sewing machine. oh caro, how awesome you are! this bag is perfect...I totally want one! Girl, that is too cute. It looks like a shaving kit! Great fabric. Love. 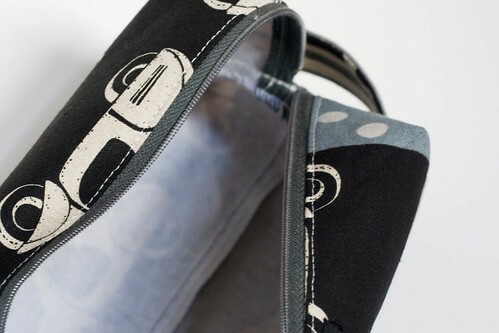 I've been having trouble finding bags for medium-sized projects (too big for a ziploc, too small for a tote) and I love the streamlined look of this. Time to go through my fabric stash, I think! Scooters! It's such a cute bag! And is that colorwork a hint about your secret mittens? I love that people are starting to hint about their mittens. Yay!